Teclab Work Surfaces fit virtually any requirement. Teclab provides you with a versatile selection of work surface materials to meet any application. 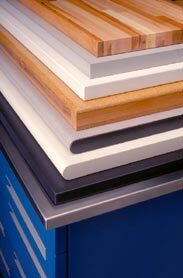 These materials, used in countertops, shelving and back guards, are described below. Work surface components are available in both standard and custom dimensions to meet your requirements. Edge-Grained Maple Solidly constructed of edge-grained maple strips with clear surfaces and ends. Seasoned, kiln-dried maple strips are bonded together with tough resin glue and electronically cured, planed and sanded to specifications, then varnished  baked between coats  for a highly water and abrasion resistant clear finish and a satin-smooth resilient work surface. Maple countertops are 1 3/4" thick, shelves and back guards are 1 1/4" thick. Teclab Self-edged Laminate work surfaces feature a full 1/16" high-pressure plastic laminate covering a 1 1/8" industrial grade particle board core. The bottom is coated with a phenolic backer sheet. Work surfaces and shelves are available in both 1 1/4" and 1 3/4" thickness; back guards are 1 1/4" thick. Teclab self-edged work surfaces are manufactured with matching laminate on each of the 4 edges. Teclab PVC-edged Laminate work surfaces are constructed in the same manner as Self-Edged Laminate work surfaces but with a 3mm thick PVC edgebanding to provide excellent resistance to bumps and scrapes that could damage the edge laminate and cause it to peel away. The edge-banding color closely matches the laminate color and comes standard on Teclab Work Stations. Teclab Composite Resinwood work surfaces are constructed with a 1" thick industrial grade particle board core with clear hardwood bands on the front, back and sides. The top and bottom are 3/8" thick urea formaldehyde-free phenolic resinwood with a two-coat catalyzed varnish finish. The front edge has a 3/8" radius. Overall thickness is 1 3/4". Chem-Surf® Laminate work surfaces are used in environments where the possibility of chemical spills rules out the use of standard laminates on work surfaces or where costs prohibit epoxy resin, slate, marble or granite surfaces. Teclab Electrostatic Dissipative (ESD) work surfaces are manufactured using ESD laminates. A 180º roll on the front edge ensures continuous conductivity along the front edge of the work surface. These countertops provide a colorful, durable, and reliable work surface with the recommended surface resistivity of 1 x 106 to 1 x 109Ω. Tec-Resin Epoxy work surfaces are monolithic, offering consistent chemical resistance throughout. They are molded from modified epoxy resin, compounded and heat cured. Tec-Resin Epoxy offers outstanding resistance to acid, alkali and solvents, as well as physical abuse. The low-sheen black satin finish makes Tec-Resin Epoxy an ideal work surface, both aesthetically and functionally. Tec-Resin Epoxy work surfaces are ideal for use in applications requiring maximum physical and chemical resistance. Tec-Resin Epoxy countertops and shelves are 1" thick and will have a continuous drip groove 1/8" wide 1/8" deep on the underside of all exposed edges. All exposed edges are finished with a 1/8" bevel; back guards are 1" thick. Available in Black, Grey, or White. Teclab Stainless Steel work surfaces are constructed of 304 stainless steel with a #4 finish. Corners are formed, welded, then polished and ground to match the pattern. Reinforcing channel members are welded to the underside to provide structural rigidity to the entire surface. Overall thickness is 1".